Our visit started Christmas Eve, with an impromptu dinner ashore with 10 others. Then a Christmas day potluck, turkey and ham provided, with impressive dishes coming out of small galleys. We left Barra and started our exploration south, re-tracing many of the spots we'd discovered with Bryan. Lots of snorkeling, hiking, shopping, eating, and lounging pool side when available. This morning I was calculating our progress since we left San Francisco and we have traveled more that 1700 miles. As we head South we have done a fare bit of easting. In fact, we are east of Denver Colorado now. If you want to track Shindig on the map here are a few links. We turn this on and put out position reports when we leave and arrive at an anchorage. On longer trips we'll turn on automatic position logging and updates are made every 10 minutes or so. This position is updated when I connect on the ham radio and the reported position sometimes lags a day or two. A small version of this YOTREPS map is on the front page of the blog too. This afternoon, Shindig will be on the move. We are leaving Barra de Navidad and sailing 20 miles South to a small anchorage North of Manzanillo for some snorkeling. Merry Christmas!!! Wishing you all a very Merry Christmas from the land of sunshine, sandy beaches, palm trees and warm Mexican culture. Our thoughts are with our friends and family, far and near, who we keep close to our hearts. We've spent the last week or two exploring the anchorages to the north and south of Bahia de Navidad. Adventures have included many overnight trips to nearby secluded anchorages, with fantastic snorkeling and tasty menus ashore. A few errands were thrown in to ensure we have enough provisions aboard as well as fuel and laundry done. Shindig is looking neat and clean as she's has had several nice washes by eager staff when we've pulled into marinas. In the towns of Barra de Navidad and Melaque, the restaurants and shops sport some blow-up snowmen and reindeer, many twinkling lights and a few decorations in the neighborhoods. Everyone is still wearing shorts and t-shirts. The small tiendas (stores) may have decorations for sale, but overall, the appearances are of a perpetual beach town with colored surf wear, inflatable toys and flip flops for sale. 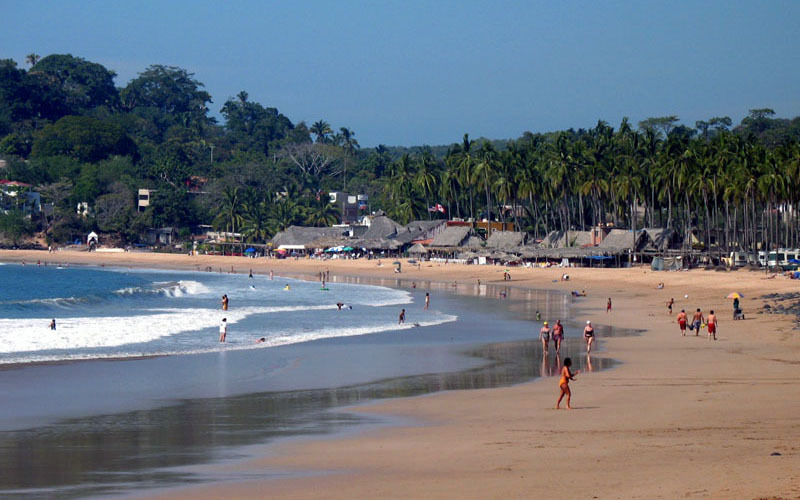 Further off the beach, the stores offer tortillas, fresh fish, street tacos, bananas and pineapples. There are no timeshare presentations here. We're treating ourselves to some marina time now, and are at the Wyndham Hotel's Grand Bay Hotel Marina. It is a fantasticaly deluxe resort, with all the amenities. Not surprising that Nancy is in the gym every morning. The first day we enjoyed french fries and pina coladas pool side. We explored each slide that connects the three main pools. There is even a "secret" pool off the 10th floor, with incredible views of the marina and lagoon, and quiet chaise lounges. During our first night, we hosted a small Shindig with three other couples. A few nights ago we had a little reunion hosted by Patty and Ken on Oogachaka, with Brian and Elizabeth from Autumn Wind. There was a lively game of electronic charades; the ladies lost, but are eager for a re-match. The French Baker also makes his way via boat to the marina daily, where he delivers fresh baguettes, croissants and other pastries. Muy Bueno! Bonjour! Would you like pain de chocolat or a baguette aujourd'hui? Bryan is here! He flew in from Boston a day after his sophomore finals at Northeastern. As he had to get to the airport by 5AM, he stayed up all night before traveling. Nancy met him at the airport, shared a cab back to town with another sailing boats visitor, took a water taxi out to the sailboats anchored in the Barra de Navidad lagoon. We went ashore for dinner, had some ice cream and planned our voyage for the next morning. Instead of turning right, to bring him up to Tenacacita, we impulsively turned left, and headed an equal distance, about 20 miles, towards Santiago Bay , near the Las Hadas resort. We were in search of new snorkeling spots and had heard there were some excellent ones. Fishing lines were deployed; three bonita were caught, and we were on our way. Several friends have wondered what I am doing on board to “stay fit?”. Last February, I had joined the Mountain View YMCA, and worked up to going every weekday, taking cardio kickboxing, body sculpting, an occasional Zumba class, 30 min boot camp or walking an hour with the “ladies”. It was great fun. With the anticipation of a very different lifestyle, I consulted a fitness trainer who had actually gone sailing on a similar trip, for ideas and exercises to keep me fit. So I moved onboard with my exercise kit: one pair of dumbbells, a full set of colored elastic bands with nice handles, a folder with a collection of strength training /floor type exercises, workout music playlists and yoga tapes. I left the 15 lb kettleball and a 2nd pair of weights in our car. There is only one level place in our main salon where I can squeeze in to do push-ups, planks and yoga. It’s hot here in Mexico, so this is only an early morning routine. Rob is good about ignoring me during my exercise times; he’s happy sitting at the chart table, near all the technology, and working the VHF or Ham radio, while “Shake your booty" is blasting on the stereo. When we are on longer sailing passages, there’s plenty of time to do some more exercises in the cockpit. On a quiet watch, I’ll do sets of bicep curls, hammer curls, triceps and deep knee bends, plus general stretching. Just living on a boat, whether at a marina or anchorage plus sailing, is very physical work. There are steep stairs in the companionway connecting our outside to the below. Some day I’ll count how many times we go up and down, or carry a pedometer to see how miles we “walk” during a day or two of sailing. We also enjoy snorkeling, swimming and hiking. Walking a long beach with the waves and sand tickling my toes is my favorite meditation. Our stand-up paddleboard is a nice way to get exercise as well as check out other boats in a quiet anchorage or marina. In Tenacatita Bay, Rob dropped me off at a 2 mile long beautiful sandy beach. I walked back and forth for an hour, finishing up with more squats, stretches until he picked me up. We’ve found some Yoga classes being offered daily in both La Cruz and Barra de Navidad. Rob has enjoyed his first few sessions with me this week. We want to do that more regularly. After an afternoon of playing in the surf with our paddleboard, we were ready for our late afternoon siestas. Here’s to Health and Happiness!! In my 3rd year of engineering school I took a semester off to go sailing in Mexico. I had met the owners of the Formosa 50 named Climax at Avalon harbor in the Channel Islands as they were making their way South. We hit it off and when the opportunity to join them came up I jumped on it. Mom and Dad were a bit freaked out and thought I may never return and complete my last year of school. They were cautiously supportive and we kept in regular contact via the Ham radio. During the 5 months aboard I traveled from Cabo to LaPaz then across to Mazatlan and as far South as Zihuatanejo. One of the places where we spent a lot of time and I have fond memories of is the town of Melaque. This town is just north, across the bay of Barra de Navidad. In the last 24 year Barra has become a destination for vacationers and boaters . 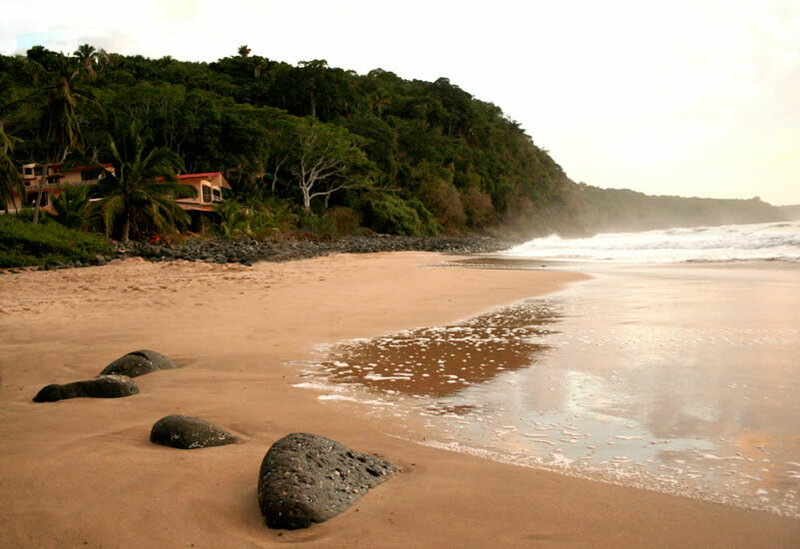 Melaque has changed some but remains a quaint working class town on the beach. Bungalows - All the hotels in town call themselves Bungalows. I haven't seen this anywhere else in Mexico but in Melaque there is a Bungalow for rent on every block. Expats everywhere - You can't swing a dead cat without hitting a Canadian. Beach square moved - There used to be a town square right on the beach. I think this prime spot became a Bungalow. Soccer teams training on the beach - The soccer teams are very active in Melaque and they train on the beach every day. School kids play in the waves - After school lets out the teachers bring the kids to the beach to play in the wave and goof off. Fishing from shore - The local fisherman throw cast nets from the beach. There is skill required! Victoria Beer - The local brew is called Victoria. I bought a few yesterday and honestly didn't like it that much. BTW, I did return to school and aced my last year of engineering school. I lost track of the S/V Climax and wonder how far they got down the coast. Now I feel some sort role reversal, with Nancy and I on Shindig, I see a little bit of myself in some of the young crew that came down on the Baja Haha. Canadians enjoying the beach. Shindig in the anchorage. A view of the anchorage from a palapa restaurant. Crazy awesome ribs at Tacos Scooby. I love Scooby Snacks. Tenacatita was an overnight sail/motor from LaCruz. We are early in the season for this anchorage and there were only 2 other boats. One of them by chance was also from Sausalito. We had a great visit with "Good Karma". Lunch was enjoyed ashore with Harry and Lina and wine was consumed in the anchorage. We look forward to exploring more of Tenacatita when Bryan comes to town. Cuestecomate is a small "secret" anchorage just 12 miles South of Tenacatita. We were the only boat there for two days and the clear water invited great snorkeling. Our crew: Spot and Piggy (an egg timer) that keeps us company and awake when alone on overnight passages. We had a fun, productive visit within Banderas Bay last week. We only had time to visit La Cruz, a sleepy fishing village with a live music scene, as their marina was our destination. 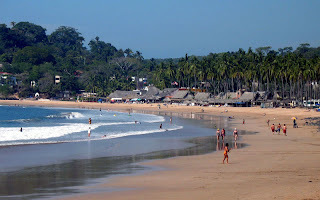 But we plan to make Banderas Bay our "home base" for early 2013, and will have more time visiting Yelapa, Puerto and Nuevo Vallarta, Bucerias, Sayulita, and Punta de Mita. We passed by Punta de Mita on the north, and headed straight for La Cruz. We planned to stay 2-3 days to mostly take care of Shindig maintenance, with some local cuisine, provisioning and laundry to be done. As we arrived, we admired the gleaming boats in the marina as well as thatched hut roof of the Sky Bar on top of La Cruz Yacht club. Rob was approached within 5 minutes by different boat resources, asking how they could help. The marina staff, especially Blanco, was super accommodating, helping with hair appointments, directions, and even programming our Mexican phone to English menus. Below is Rob's update on some of the maintenance work. Nancy was happy to have clean laundry, find some good taco stands, and chat with locals who have made La Cruz their winter home. La Cruz is known for its live music scene, and she was invited to play honky-tonk piano with a pick up band on Monday. She has not accepted, yet. Pretty view of marina boats. Shindig is 2nd boat on left, with the bow in. The engine oil change went smoothy. Shindig had motored 157 hours since we left San Francisco Bay on 9/15/2012. The fuel filter change didn't go as smoothy. The swap of the primary and secondary filter went fine but I didn't adequately prime the secondary filter and got air into the injector lines. I now know how to bleed the entire system from one end to the other. I call it, "polishing your engine with diesel fuel". It is a mess. The clean up was a pain but everything went back together fine and "Perky" is purring. Our refrigeration system has been working overtime on this trip. We have a fridge and freezer that is kept cool with an 1/2 HP DC motor belted to compressor. In El Cid, Mazatlan, I found a freon leak and added 1 kilo of refrigerant. In La Cruz we ran out again. Fortunately I was able to locate more refrigerant 10 kilometers away in Bucerias. The system is recharged and I have ordered a diagnostic tool (sniffer) to help find the leak. Stay tuned...... There could be a cold beer emergency. I pulled the brushes out of the refrigeration motor to size up some spares and also cleaned out all the brush dust with a little shop vac I have onboard. Not Who moved my Cheese, but …..
Who used MY brown towel?! I was reminded of the challenges and compromises of living on a sailboat recently when we were about 5 days from having clean laundry. (No, there is not a front loading washer and dryer onboard.) Many of the local villages have lavanderias, which will wash, dry and fold neatly one’s laundry for about 10 pesos (less than a dollar) a kilo. Not bad! However, we have been in “beach” mode lately, with swimming, short showers, sand etc. Hard to keep a clean set of towels around. I had brought out an old, but very clean, brown/white towel to reward myself after showering. Rob was supposed to be using our blue towels. I was reminiscing about clean towels as Rob went down below for his turn at the shower. That was a fun topic of conversation with friends under the palapa, as we all relate to the special things we appreciate on our sailboat lives. If that is my chief complaint, I think we are doing very well! And, the last stop in La Cruz included a lavanderia visit with 3-4 loads of laundry done and delivered to our sailboat. Clean towel days are here again. Our group of friends were pretty active. We body surfed, walked the beach, went scuba and snorkeling, and dinghy exploring. Other wiser couples hung out under the shade with cool limonadas and fast internet. Each day the waves and surf break got a little bigger. At first we could easily dinghy to shore, and help pull each other's dinghies up high on the beach. Later the surf was so big that only the intrepid kayaker or Stand Up Paddler could try to make it ashore. There were several fantastic dinghy landing and exits late at night. Rob helped others make it back to their boats, as well as ferry others to and from their boats. Here are some photos from a week in paradise. It just keeps getting better! Frankie, Phil, John and Rob under the palapa of knowledge.